Dickmann Manufacturing Company is a family owned, high-quality metal stamping and fabrication business that has served a wide range of industries since 1957. We specialize in developing viable solutions for our customers that help improve manufacturing processes and lower costs. In this particular project, we were currently producing a bracket for a loyal customer by laser cutting flat blanks and forming them in a brake press. As production quantities increased, we made a proposal to the customer to have a progressive die built to save cost on the piece part price. Return on investment of the tooling was less than one year and the customer accepted the proposal. 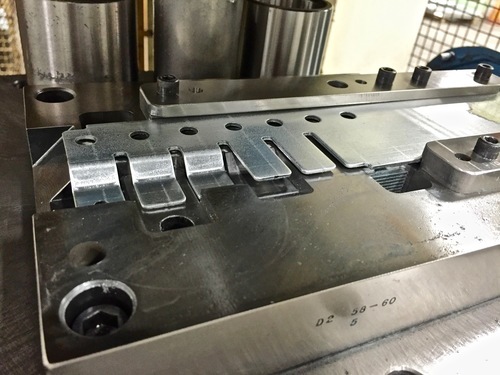 We were provided with a purchase order from the customer to have the tool built and started the process of designing and building the progressive die with one of their toolmakers. The design was reviewed with the toolmaker to make sure the tool was built to our standards with minimum usage of material and ease of functionality so the tool could run at the highest rate possible. The overall size of this manufactured part was 5/8" x 2" and is made from 16 gauge galvanized steel. As a result of our proposal, we were able to dramatically lower production costs, and pass that savings on to the customer while maintaining an exceptional level of quality. Emphasis on continuous improvement for their customers is the key to both Dickmann’s and our customers’ success.